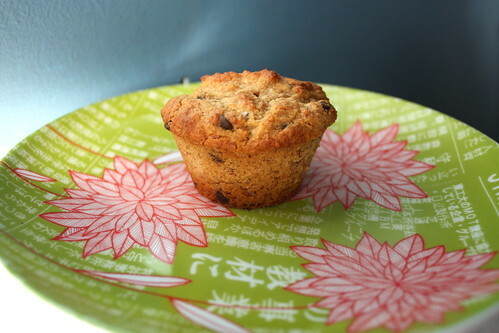 Banana Chocolate Chip Muffins - Eat. Sleep. Vegan. Rich is away this weekend. This means I have the house all to myself and can make as much of a mess as I like in our kitchen. Not that he objects to my baking things; on the contrary, he usually is a big fan of my random baking marathons. But it does mean that I’m the only one who has to put up with the unavoidable mess that baking creates on our counters. I had three organic, fair-trade bananas languishing on my counter, so decided to combine those with some mini chocolate chips and make muffins. My experiment paid off! These are great – not too sweet, a bit of chocolate and a great banana flavour. Not to mention some fiber from the oat bran, and not too crazy on the fat content with only 1/3 cup of oil in there. But hey, my goal ultimately was a good tasting muffin and I think I hit the target on that one. If you make these, let me know how they turn out and if you like them! Preheat oven to 375oC. Grease a 12-cup muffin tin or line with paper liners. Mix the mashed bananas, oil, brown sugar and apple sauce in a large bowl until well combined. In a second bowl, whisk together the flours, starch, oat bran, salt and baking powder. Once mixed, dump the contents into the bowl with the wet ingredients and stir to combine. Add in the chocolate chips and stir until chips are well distributed through the batter. Fill muffin cups full – with my tins I had exactly enough batter to fill the tins and none left over. Bake in your preheated oven for 20-25 minutes, until the tops are lightly browned and a toothpick inserted into the centre of one muffin comes out clean. If your oven doesn’t heat very evenly (like mine!) you’ll want to turn the tin around 180o after 15 minutes, to make sure the muffins cook evenly. Eat fresh out of the oven. If you have leftovers, store in an airtight container; they’ll keep for a few days.